Wow! Crossroads Gin is finally on tour, on the road, travelling across America together in a van. Where each of the earlier books in the series told the story of one couple, all of the bandmates are present for this long awaited catch-up. With various partners joining the band at different stops along the road, fans of the series get to catch up with each couple and watch all of the Sinners’ men interact together in a way we haven’t seen before. I forgot how much I loved each of these characters and each of the couples. And seeing the band properly together for the first time, I fell in love with the band as a whole. More than a romance, this is a story of friendship and brotherhood. As always, trouble follows the band and Ms Ford adds in some suspense and intrigue to spice up the story. As I’m reviewing an ARC, I don’t want to give away too much, but this becomes a very exciting book by the end. I absolutely loved this, but it is a catch-up and definitely not a stand alone story. Fans of the series won’t be disappointed but new readers must start from the beginning with Miki and Kane’s brilliant first book, Sinners’ Gin. This book is such a great addition to the others in this series and I cannot wait to read the next book when it comes out. From the very first book in the sinners series till this book it has been a heck of a ride for all of the people in the band from Miki to Damien to Rafe to Forest and then you add in all the Morgan clan and there is always something going down or going on. As always Rhys Ford brings a level of mystery to this book that has been brought to the previous books and most of the mystery revolves around Miki and his past. I truly believe that someone from his past is out to get him and they will stop at nothing till that is accomplished. It seems as if disaster follows the band and it does not look like it will leave there side anytime soon. I really enjoyed following each of these couples throughout this book and seeing them come together at each disaster and walk away from it stinger then the last time. I also enjoyed watching the band find there way to becoming a real group and sticking together through the thick and thin even when they are getting on each other’s nerves. I cannot wait to read the next book in the series and find out what is waiting for them around the next corner because I have a feeling it is going to be explosive and hopefully a turning point for all these men. Another great book Rhys and keep them coming. Ah, I love the Sinner’s Gin universe. 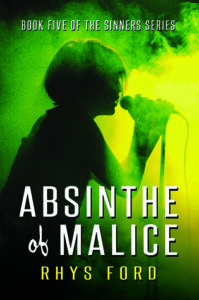 I love all the characters and it was so great to get to read about them in Absinthe of Malice. The boys are back and they’re doing a tour for their new band, Crossroad’s Gin. I love that the author didn’t go easy on them. There is action, mystery, romance and family bonding. My favorite character is Miki. I just adore everything about him. He’s been through so much and is a true survivor. Still, his story isn’t over yet cause he and his family gets put through the ringer just when things are starting to look up. I docked it a star because even though there’s romance, there wasn’t enough. It’s understandable cause the guys are apart from their loved ones, but I was looking forward to it. This book was more about mystery. Still, when the band did interact with their lovers, I was in heaven. Love, protectiveness galore! I really want another book that focuses on Miki and his love life cause I’m such a big fan of his. If not, I’m still Looking forward to another book.